The first verse of the Bible describes the energy of the Fool perfectly. It is the moment before the dawn of creation when the Divine Presence speaks “Let there be light.” This moment can often feel a bit dark and chaotic as the Spirit-wind of God flutters her wings and creates a disturbance on the “face of the deep.” But it is also a sign that something new and wonderful is about to be born! 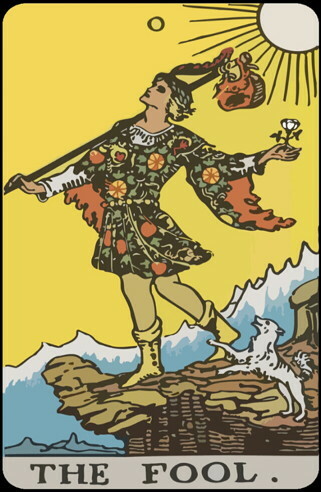 The Fool is one of my favorite cards in the deck. Whenever it appears I feel the green light to embark on a new adventure, no matter how foolish others may think it is. The Divine Presence is with me and will guide me on this new path. The Fool calls us to embody a spirit of youthful adventure and trust that the Holy One can create something out of nothing. In this moment, everything is possible and the decisions we make could be life changing. As you examine the symbols on the card, you may notice that all four elements of creation are represented. Earth is the ground beneath his feet. Air is all around him as he perches high on a mountain cliff. Water is the snow and ice that caps the mountains. Fire is the sun beaming blissfully on him. He also carries with him a pack on a staff. The staff relates to the suit of Wands and is symbolic of spiritual wisdom and discernment. The pack holds the seeds of creation which the youth is about to plant in fertile soil. 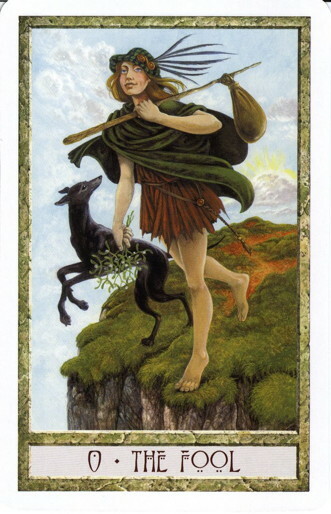 Looking elsewhere on the card, The Fool also holds a white rose which symbolizes the power of love and a white dog is at his side to serve as a guardian and guide. In the DruidCraft deck the dog is black which, for me, has the energy of the Goddess and the powers of intuition and discernment. In addition to his pack, the DruidCraft youth also holds a branch with berries or flowers on it. One could look at this as a magical herb that will be used to help him on his new path. The Fool also contains a hint of danger since the youth is standing on the edge of a cliff. This reminds us that all new adventures contain and element of risk. But if we are guided by the Holy One and listen to Sophia, Lady Wisdom, we will be successful in our new endeavor.